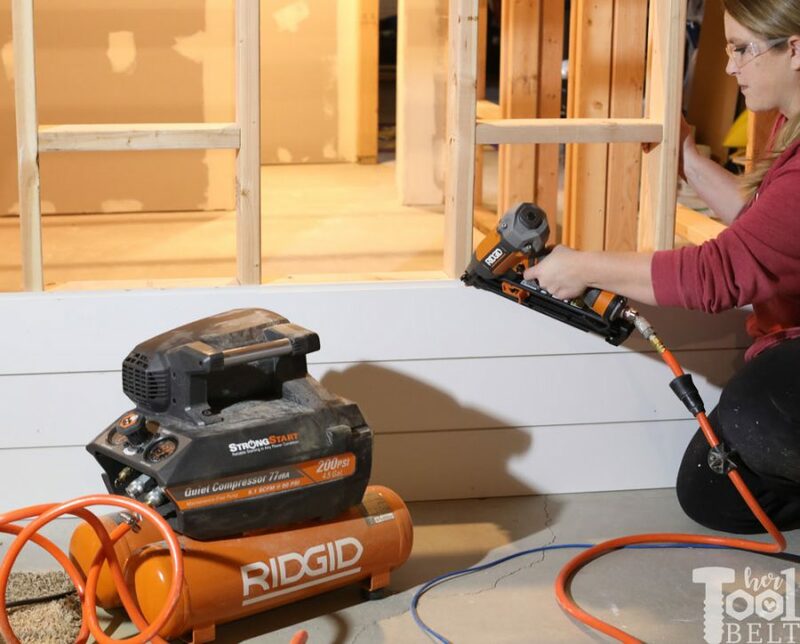 The Ridgid Angled Finish Nailer and Compressor tool reviews are sponsored by The Home Depot. I have been compensated for my time and provided with product (tools). All ideas and opinions are my own. This post contains some affiliate links for your convenience. Click here to read my full disclosure policy. I have been in the thick of building my kid’s a fun basement playhouse (ie toy room) down in the scary basement. The playhouse design includes quite a bit of shiplap for the siding and interior walls. Adding all of the shiplap and tongue and groove floor/ceiling made for the perfect project to test out the Ridgid 15 ga angled finish nailer and Ridgid quiet compressor. A sleeve of nails is really easy to load, just push up from the bottom of the magazine. Then retract the orange pusher to the bottom of the nails and you’re set to go. It prevents dry fire by not using the last 2-3 nails, add a new sleeve of nails and the nailer will use up the last 3 without a problem. I shot at least 3000 nails in MDF and pine without any misfires! It also doesn’t leave mars from the hammer on the surface. Another nice feature is that this nailer is oil-less!!! Ya for less maintenance. With a quick rotate of a switch, you can use the nailer in contact or sequential firing modes. Suggested minimum operating pressure is 170 psi. It comes with Ridgid’s lifetime service agreement. 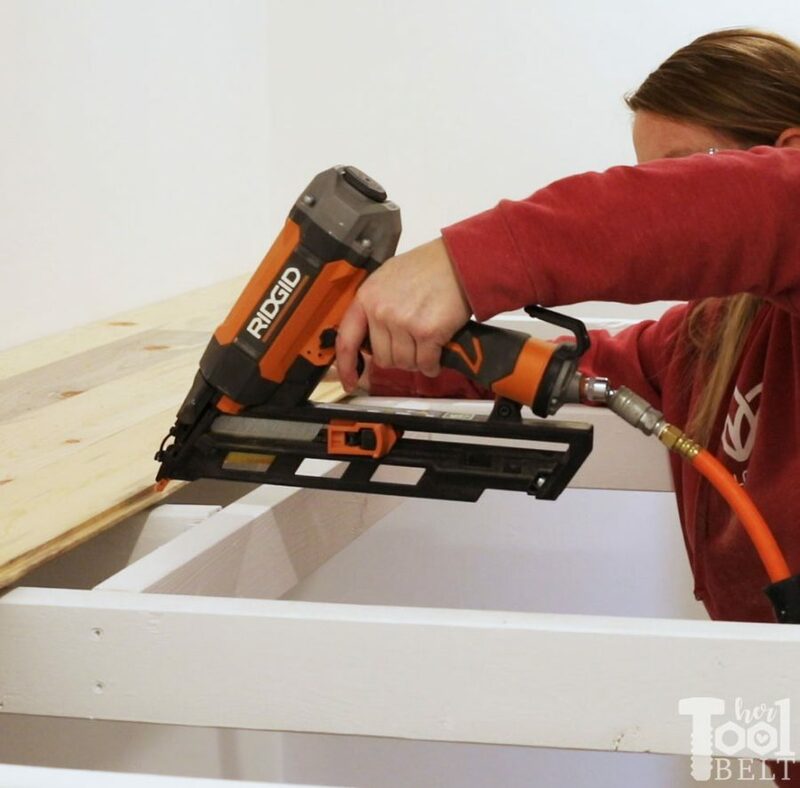 Using the angled finish nailer is really useful for nailing in corners, no bulky tool bodies in the way of the corner shot. It is also great for toe nailing on the tongue and groove floor. Honestly I don’t have any cons for this nailer, it is a solid tool and great to have in your carpentry tool box. 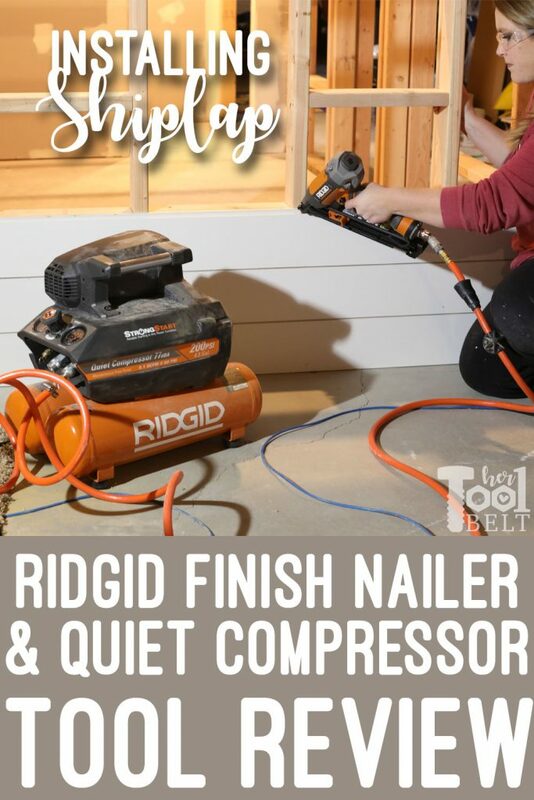 To run this nailer, you have to have an air compressor. 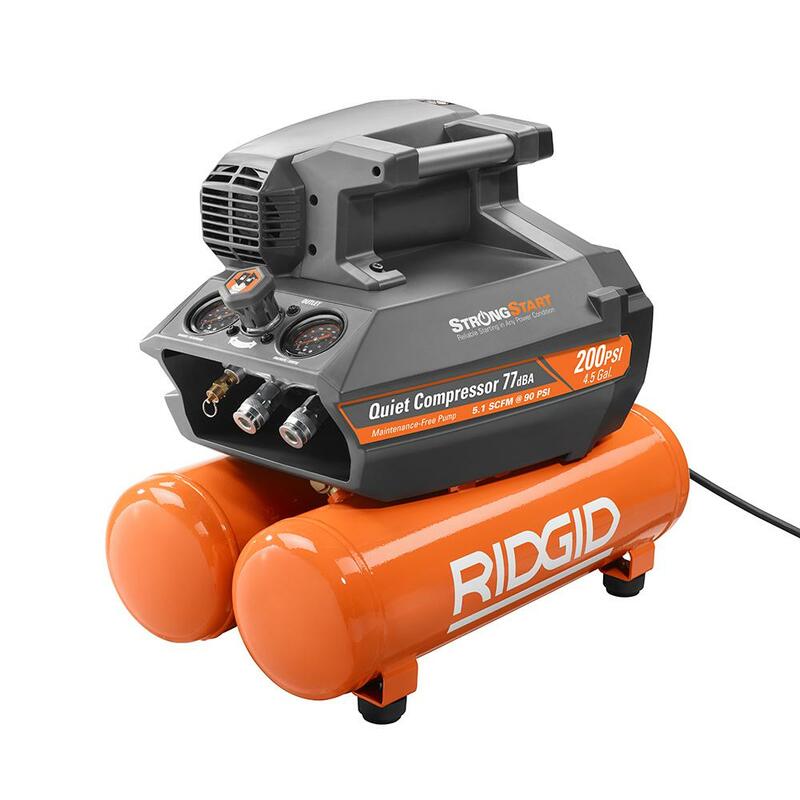 The air compressor I used is the Ridgid 4.5 gallon Quiet Air Compressor. This compressor is significantly quieter than any other compressor I’ve worked with. Even working with little kids around, it didn’t scare them when it kick on, which is awesome. The advertised decibel rating is 77 dBA. The maximum pressure is 200 psi. The pressure regulator has a lock. There are 2 quick connect ports for hoses. 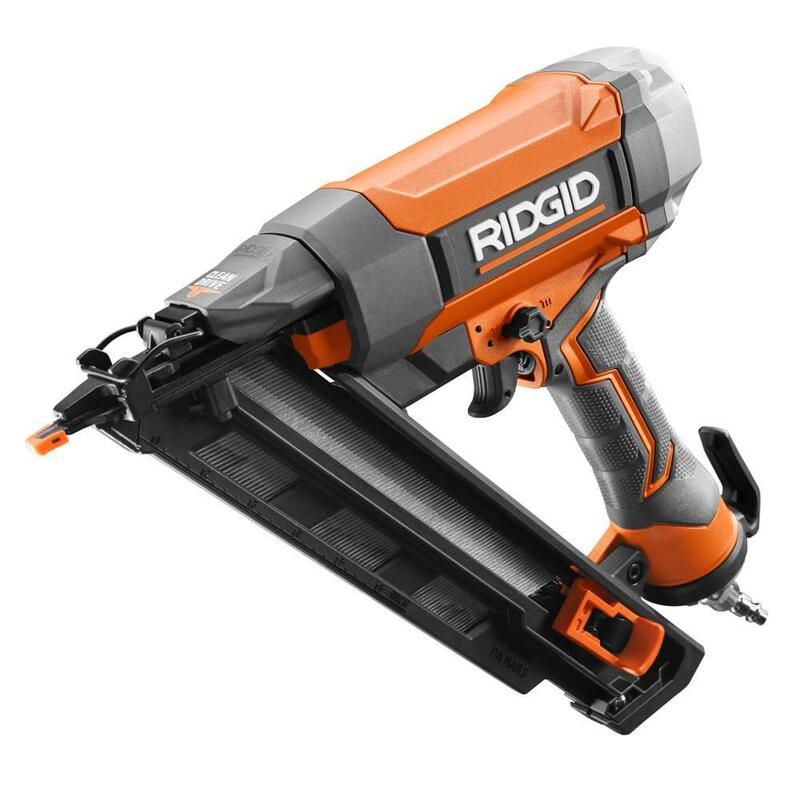 Comes with Ridgid’s 3 year limited warranty. Ok so what’s the con for all of these features? 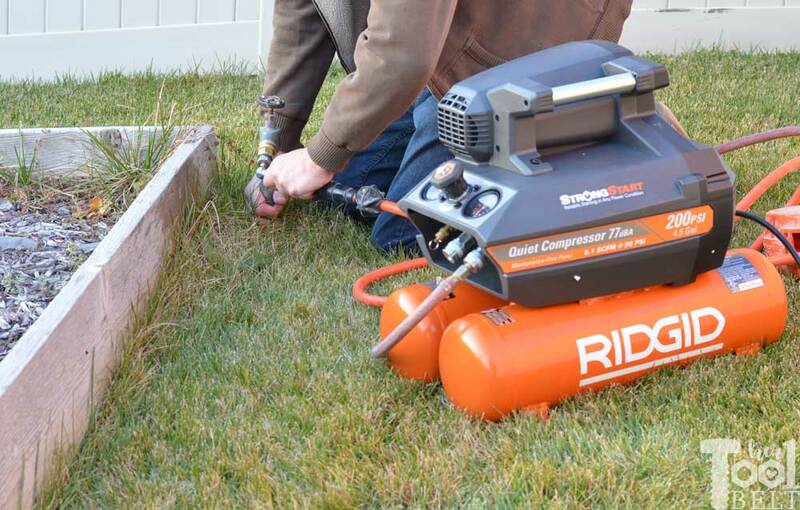 The compressor is portable, but at 61 lbs, I wouldn’t want to lug it around for too long. The handle placement is a tad bit awkward for me, because it wants to swing the compressor into my legs. But as far as function, this is a great unit!